Hello Everyone! I know it's been awhile...almost four months since I last posted here, but that doesn't mean I haven't been soaping. Because, well, how can you abstain from soaping for four months really? I've made seven batches of cold process soap since my last post and I've been reading and watching videos on how to make liquid soap. I must say that my friend Darinka from DI Prirodni Sapuni was instrumental in braking my resistance to spending four hours or so cooking soap, but more about that when I buy KOH and get to business. For now I just thought to say hello and post some pics of this DIY box I made following this Soaping 101 video and tweaking it a bit to fit my needs. The thing is, my kids had, not one, not two, but four (what is it with the number 4 in this post anyway...) birthdays to go to last week and while they did shop for some gifts earlier, they didn't find gifts for everyone and I had to save the day with soaps. So I took a large sheet from my daughter's aquarelle block, folded it so that one side is about half a centimeter larger than the other and cut it where it was folded. Then I cut another 1/2 a centimeter from the side of the smaller piece. That was to be the box, and the larger piece was to be a lid. To make it prettier, I glued some patterned paper on it and then proceeded as explained in the video. I also added some satin ribbon and my daughter made a bow which we glued on top of the lid. The box fitted perfectly for three of my 5cm x 8cm soaps. Then my son decided he also wanted to take one soap to his friend, along with the gift he prepared, but I was short on time, so I just used this handy paper bag I found in the local store for 0.20 EUR. Since i still have no labels printed, my awful handwriting had to be employed. 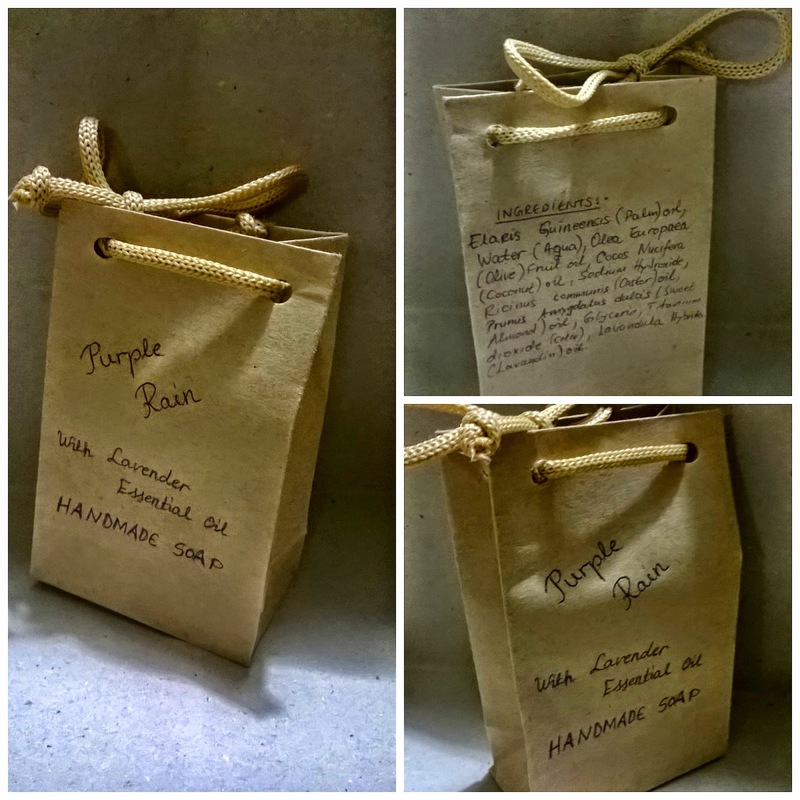 If you have better handwriting than I do, these paper bags can be a really cheap, quick and pretty way to pack your soap. If you have labels, even better. Well, that would be all for today. 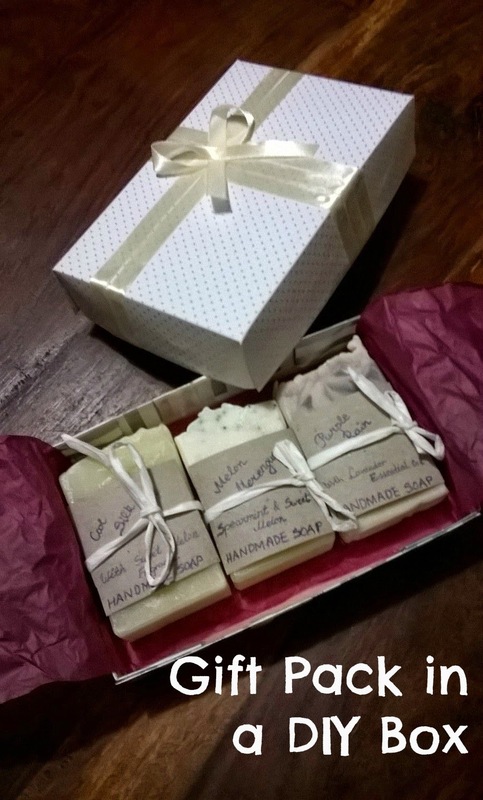 In the next post I will post the photos of those seven batches of soap I mentioned earlier and then I'm off to experiment with liquid soap that I hope could serve as a shampoo too.